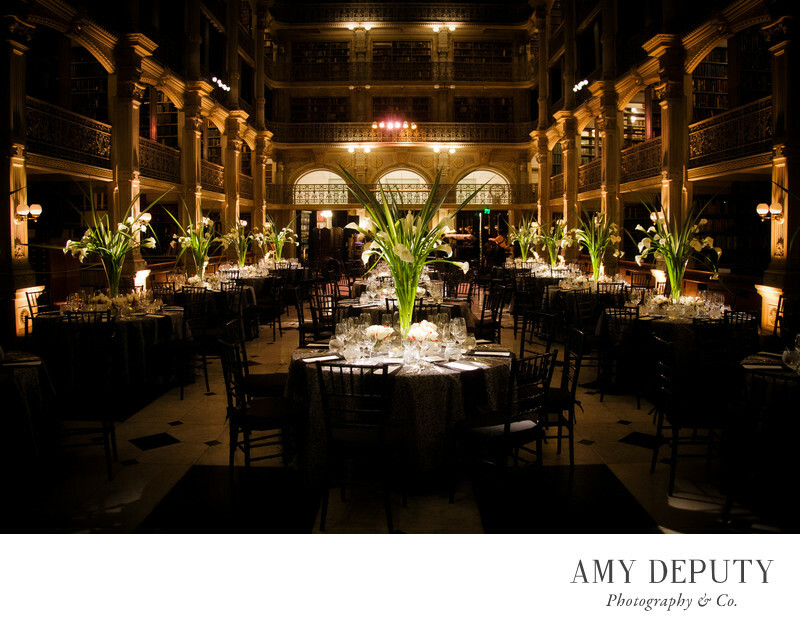 A spectacular and awe-inspiring sight, the George Peabody Library is a one-of-a-kind Baltimore wedding venue. Its towering stacks of books inhabit several levels like tiers on a wedding cake, rising up to a glass skylight illuminating the atrium. With over 300,000 volumes, the 19th century neo-Greco George Peabody Library is a perfect wedding venue for the literary minded book lover, student, or anyone looking for a dramatic and enchanting space to celebrate their nuptials. Artful lighting design highlights the ornate columns and railings lining the stacks in the evening. No matter what the angle or time of day or night, this Baltimore wedding venue is quite the stunner. Location: The George Peabody Library: 17 E Mt Vernon Pl, Baltimore, MD 21202.